In October 2013, we hosted our first Reform to Transform forum, “Drowning in Health Care Costs: All Hands on Deck,”which featured Steven Brill, the author of the Time magazine blockbuster article, Bitter Pill: Why Medical Bills are Killing Us. 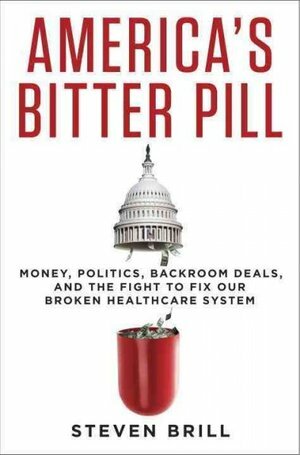 Now Brill has come out with a book: America’s Bitter Pill: Money, Politics, Backroom Deals, and the Fight to Fix Our Broken Healthcare System. In this expanded version, Brill still emphasizes that our health care system’s outrageously high prices are completely out of whack when compared with the prices charged in any other country in the world. These out of control prices are the main reason why the American system is broken – it is unaffordable now and unsustainable for the long haul. A major focus of the book is on the behind the scenes wheeling and dealing that ultimately allowed the Affordable Care Act (ACA) to pass. While Brill is a strong supporter of the coverage expansion that occurred under the ACA, he worries that the bill gave away the store to insurance companies, hospitals and the pharmaceutical industry. He criticizes the ACA for offering these corporations many new customers while not doing enough to control the prices they charge for that care and coverage. Brill also illustrates that health care is fundamentally a deeply personal issue, by writing about his recent health scare when he had emergency open heart surgery. So while the book is devoted to reporting on “money, politics and back room deals,” Brill also adds the human dimension of what it is like to be a scared, vulnerable patient. He reminds us that the combination of the personal, the economic and the political is why health care is such a particularly combustible and divisive issue. This entry was posted in Jill Zorn and tagged Affordable Care Act, Cost & Quality, R2T. Bookmark the permalink.